There’s a sort of dissonance to watching American snowboarder Chloe Kim compete, and it goes a long way towards explaining why the experience is such a thrill. Kim cheerfully, casually upends everything that is supposed to be true about a 17-year-old’s place at a marquee sporting event like the Olympics. In the context of most sports, the teen is the underdog—necessarily the least-experienced competitor out there and so the one most in danger of being overwhelmed by the moment. This doesn’t mean that teens can’t win these competitions, but those successes, when they happen, feel wholly unexpected and joyous. 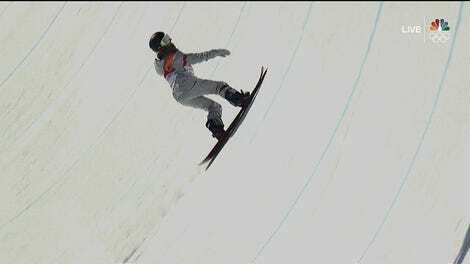 Chloe Kim is not that teen. There is nothing unexpected about her, which makes the joy and awe that defines the experience of watching her that much more remarkable. Snowboarding is of course a different beast, and one in which competitors hit their primes at very young ages. But even in the context of this sport, Kim’s dominance is startling. There was the astonishing performance that she delivered in the halfpipe yesterday, which included two runs (93.75 and 98.25) that were far ahead of the rest of the field as well as the back-to-back 1080s that have become her signature. Such a performance was entirely expected of her, which is wild. She still exceeded expectations, in ways that show up in the scores and ways that don’t, which is more impressive still. This wasn’t exactly like Tiger Woods coming out of nowhere to dust the field at the 1997 Masters, or Randy Moss arriving from Marshall and instantly destroying NFL secondaries. Yesterday may have been Kim’s first appearance at the Olympics, but she came into them not as a potential phenom but as a fully-formed, dominant athlete. You may have heard by now that Kim was good enough at the age of 13 to have competed in the 2014 Olympics. She wasn’t allowed to, because of Olympic rules that stated athletes had to be at least 15 years old by the end of 2013 in order to compete in Sochi. If not for the age rule, it’s likely that Kim would have taken home her second Olympic medal yesterday. In the qualifying events leading up to the 2014 Olympics, Kim finished in second place twice and third place once. Big sporting events in which you don’t have a vested rooting interest offer a binary choice between the underdog and the favorite. Do you want to see the Patriots pull off 19-0 or do you want a doofus named Eli Manning knock them off? Do you want the Warriors to cap off a record-breaking season with a title or do you want to watch LeBron hulk out and down them? The allure of the underdog is real and human and tough to escape, but sometimes the all-consuming brilliance of the favorite is too intoxicating. Does anyone ever really root for some random schmuck to beat Serena Williams? What struck me while watching Kim cruise to her gold medal last night was what a unique rooting experience it was. Here was someone who brought the awe that comes from watching an athlete who is miles ahead of her competition, and combined it with the thrill of cheering for someone who is on the biggest stage for the first time and should by rights be terrified. It’s exceedingly rare for an athlete to occupy those two forms simultaneously, and yet Kim wears it with startling lightness and ease. In four years Kim will probably return as the unassailable favorite ready to fend off whatever precocious prodigy rises to challenge her. But for now she’s both of those things, the champion and the future champion, which is to say that she is the best kind of athlete to root for.